Food glorious food. And not the run-of-the-mill fare we eat most days. This week I stepped into Siem Reap’s otherworld – a tiny slice of food luxury that most Cambodians and many visitors will never experience. It was a stark contrast to the dust and the grime, the little restaurants with blue and red plastic chairs selling $1 fried rice and the popular haunts in and around Pub Street. It started with an invitation to CAMFOOD’15, Cambodia’s largest food and beverage expo, which to be fair, was not all about luxury, but it did feature some of the finer points of food and beverage consumption available in the city. 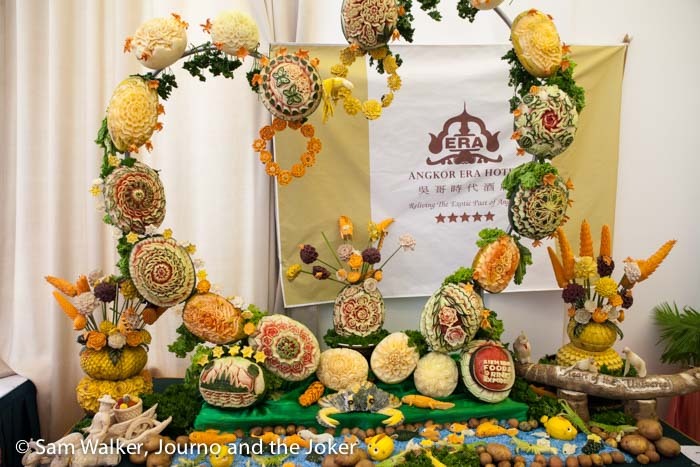 Including these amazing food carvings. Who knew you could do this to watermelons, squash and other fruit and veggies? I guess it shouldn’t really be a surprise, given we are in Angkor, home to ancient temples renowned for their exquisite carvings. If you can carve it out of stone, there’s no reason you can’t carve a vegetable. 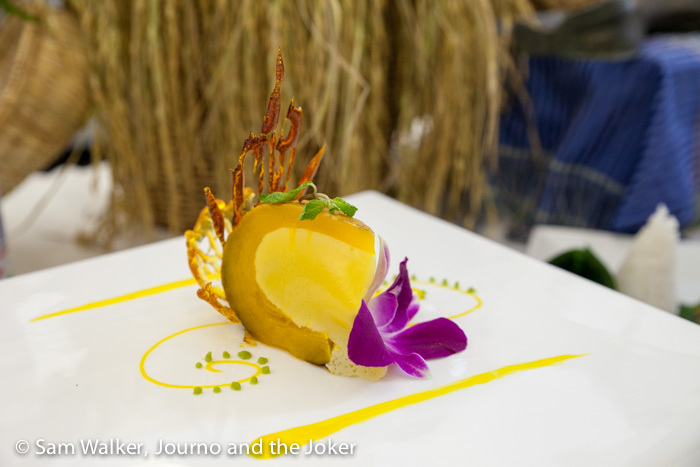 Some of the nation’s up and coming chefs took part in a variety of competitions and the results were stunning, including this pumpkin custard dessert. 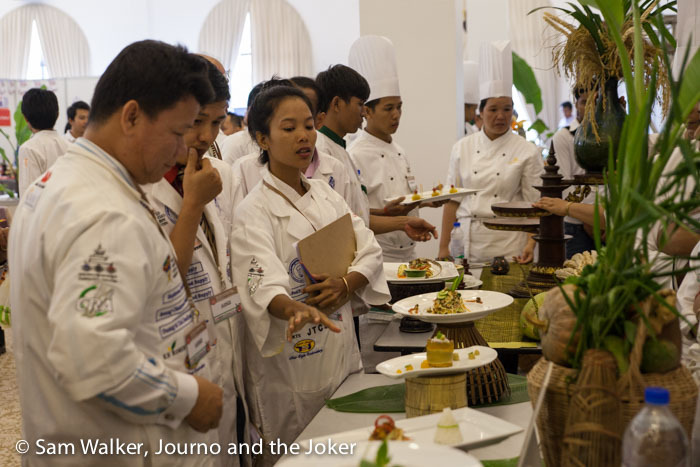 And they were judged by some of Cambodia’s leading chefs and movers and shakers in the food and beverage industry. It was a very serious business. But the event also featured the diversity of foods available for restaurants and kitchens, including plenty of imported products. I was a bit disappointed that more Cambodian foods were not included as there are some fine things happening in this country. I also received a media invitation to a luxury dinner at the Sofitel this week. I arrived at the front entrance in a tuk tuk with my hair wind-blown and my skin whipped by the elements and the odd bit of sand-blasting from the dusty streets. And walking through the doors was like entering another world. The dinner was hosted by food distribution company Aus Khmer and I had been expecting that it might feature some prime Australian beef. I admit I was looking forward to sinking my teeth into a steak. What I hadn’t realised was the night was all about show-casing their French products – in particular duck and foie gras. Gulp! 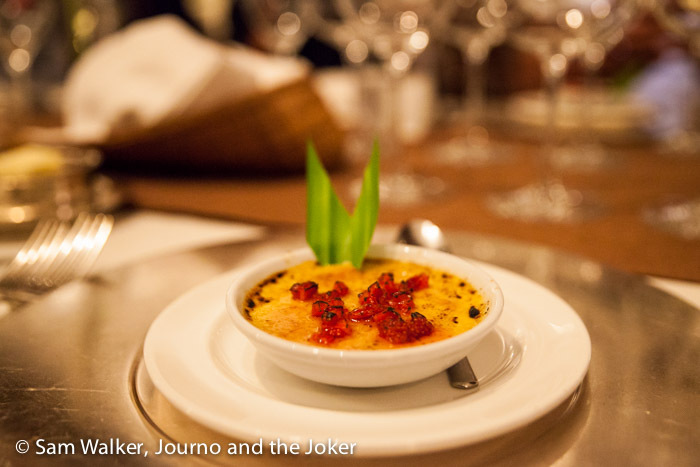 So here I was, surrounded by some of Cambodia’s finest chefs, including executive chefs from the likes of the Sofitel, Sokha and the Raffles, being dished up foie gras, and not really knowing how to cope with the experience. I’m not a fan of offal at the best of times and I’ve sworn off of trying foie gras because of the treatment of the birds. Foie gras is a French delicacy and is the liver of ducks that have been force fed vast quantities so that their liver enlarges. Yeah, fun stuff hey? I am going to confess that I tried it. I know I could have rebelled but honestly, the meal had been cooked and not eating it was not going to do anything for the health and welfare of these ducks. The first dish was this foie gras creme brulee with strawberries. It was almost sweet enough to be a dessert and I could not taste the foie gras in it. Subsequent dishes included large quantities of foie gras and it was not to my taste. Aside from the enlarged duck’s livers it was an entertaining evening with interesting people, fine wines and a delicious dessert in an exquisite setting – a little piece of Siem Reap that seems almost unreal. Have you had a food experience that has taken you on a journey to another time or place or taken you out of your comfort zone? We’d love to hear your story.